I’m not sure how Dubba and I both didn’t end up reviewing Haagen-Dazs Salted Caramel Truffle last year during its original run as a limited edition flavor. We both enjoy Talenti’s Sea Salt Caramel so it’s a shock neither of us jumped to try this one. Whatever the case may be, Haagen-Dazs decided to bring it back for another year so let’s get right into this. In describing Salted Caramel Truffle, Haagen-Dazs says they “blend smooth, sweet cream ice cream, ribbons of rich salted caramel, and decadent chocolaty truffles to create this indulgent delight.” Scratch that Talenti comparison I mentioned earlier, this one sounds more like my beloved Sea Salt Caramel from Homemade Brand. That flavor is easily in my Top 5 and I honestly can’t believe I didn’t try this one sooner. I’m excited to see how Haagen-Dazs can put a more of a premium touch on Homemade’s version because this one looks promising off the bat. You have a bunch of truffles peeking out and the salted caramel ribbon is making an appearance as well. This was just a sign of things to come because this faux pint was loaded with both of those components. The sea salt caramel swirl is thick and gloppy. I like my caramel to have some pull to it and this one lacks that characteristic. Taste wise, the swirl is saltier than I had expected. It’s not so salty that you want to reach for some water but it’s one of the saltiest swirls I have encountered. The saltiness works perfect with the sweet cream base. I’m a fan of sweet cream bases because they really allow for the mix-ins to shine without being too distracting like a strong vanilla or chocolate can be. The base is standard Haagen-Dazs quality though it does seem to melt a bit faster than some of their other flavors. The flavor isn’t all that strong but like I said, it’s well suited for strong mix-ins like the chocolate truffles. The truffles are about the same width as Homemade’s version but a bit taller. Being as they’re called chocolaty truffles; I thought they were going to be filled with fudge like the ones found in their White Chocolate Raspberry. Instead they’re filled with the same salted caramel that makes up the swirl. They add a burst of saltiness every time you run into one which is pretty much every other spoonful. 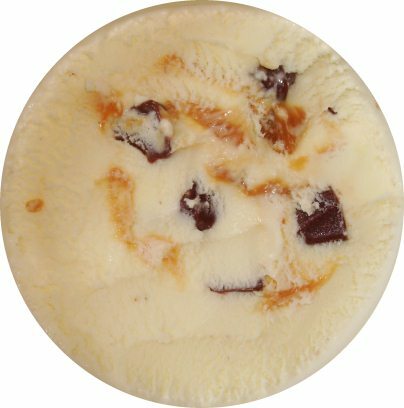 The chocolate flavor is almost an afterthought and the salted caramel tends to dominate that combination. While this is a well exectuted flavor, this one just didn’t blow me away like Homemade Brand’s version. Don’t get me wrong, I’ll be picking this one up again before it’s gone at the end of the year. It’s just not quite as amazing as I was hoping it was going to be. Verdict? Another great caramel truffle flavor on the market. Buy Again? Yep especially since I can’t find Homemade Brand in my area. I'm with you on this. I wasn't blown away by this one either. I like Haagen-Dazs' Sea Salt Caramel gelato better. Nick, I did try this one last year and I had the same feeling. A year later, I don't remember much about it other than I liked it. I haven't bought it since. @Stride: Man you really do enjoy that gelato aha. 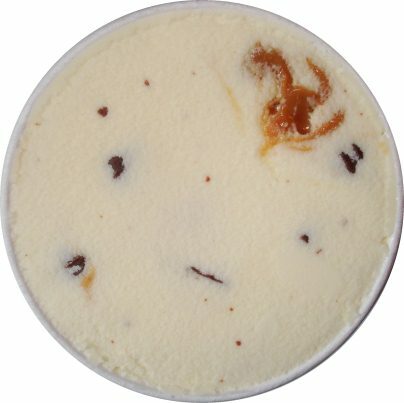 I'd like to see how that gelato would do if they had included the truffle from this flavor and made a Talenti impostor. @Danielle: Yeah, I'd much rather have Homemade Brand's but this would do as an alright substitute. I think that you are all insane. :) I loved this flavor, aside from the disgusting truffles. Chocolaty = Crappy. @Data, by no means is this a bad flavor. I think I'm just corrupted by Homemade Brand's version. 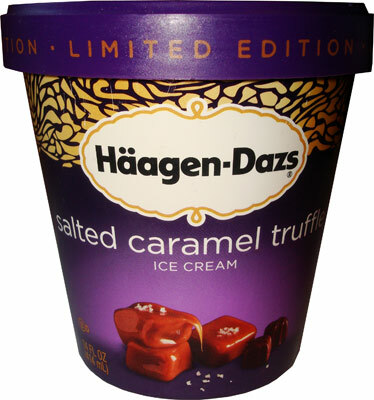 If Haagen-Dazs included a truffle mix-in with their Sea Salt Caramel gelato or anything chocolate coated, then it'd probably be even more incredible. I will love to see them do such a thing. @Nick. Yeah, that is the impression that I got from your review. I haven't tried the Homemade Brand version. I live in an extremely small, crappy town that only has a WM & Publix, so good ice creams are hard to find. I'll make a point to try Homemade Brand once I move. @Data: I feel your pain. I live in the middle of no where and literally have two grocery stores close to me but a bunch more a little drive away. Homemade Brand is only carried at The Fresh Market which is a god hour away from me and their selection is terrible. If you're able to find their ssc though, let us know what you think!